CD review: "Baby, You Can Get Your Gun!" This review first appeared in the September/October 1988 issue of Living Blues magazine. 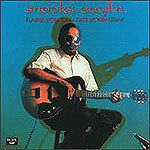 Snooks Eaglin is no fret-burner in the mold of Albert Collins or Albert King. His is a slow-burning passion, with an occasional flame licking its way up the neck of his guitar. It was this stylistic control that made Eaglin the perfect complement to Professor Longhair during their years together in New Orleans in the 1970s. Eaglin is joined on this album by drummer Joe Johnson and bassist Erving Charles, both from Fats Domino's band; keyboardist Ron Levy and guitarist Ronnie Earl from Roomful of Blues; and saxist David Lastie. As a unit, these guys are tight. As side soloists, Lastie and Levy stand out. Producer Hammond Scott's liner notes outline the obvious when he points out that "Profidia" is a tribute to the Ventures. Eaglin perfectly captures the sound and flavor of the surf-rock pioneers. Scott also points out that "Oh Sweetness" and "Pretty Girls Everywhere" are similar to Longhair's barrelhouse style of boogie. While these tributes to others are fun (with the exception of the James Brown-influenced "Drop the Bomb," which never quite gets going), it is the tunes that are uniquely Eaglin's that are the most rewarding. The title track may be the best of these. His guitar solos show him off in top form, with Levy also given room to stretch out on piano. Eaglin's vocals are as strong as his fretwork. His strong tenor voice adds a richness and depth to the material that makes this album doubly rewarding.